This statement was published as: Early Identification of Hearing Impairment in Infants and Young Children. NIH Consens Statement 1993 Mar 1-3;11(1):1-24. For making bibliographic reference to the statement in the electronic form displayed here, it is recommended that the following format be used: Early Identification of Hearing Impairment in Infants and Young Children. NIH Consens Statement Online 1993 Mar 1-3 [cited year month day];11(1):1-24. The National Institutes of Health Consensus Development Conference on Early Identification of Hearing Impairment was convened to address (1) the advantages of early identification of hearing impairment and the consequences of late identification of hearing impairment; (2) the issue of which children should be screened for hearing impairment and when; (3) the advantages and disadvantages of current screening methods; (4) the question of which model for hearing screening and followup is preferred; and (5) future directions for research in diagnosis and management of hearing impairment in infants and young children. Following 2 days of presentations by experts and discussion by the audience, a consensus panel weighed the evidence and prepared their consensus statement. Among their findings, the panel concluded that (1) all infants admitted to the neonatal intensive care unit be screened for hearing loss prior to discharge; (2) universal screening be implemented for all infants within the first 3 months of life; (3) the preferred model for screening should begin with an evoked otoacoustic emissions test and should be followed by an auditory brainstem response test for all infants who fail the evoked otoacoustic emissions test; (4) comprehensive intervention and management programs must be an integral part of a universal screening program; (5) universal neonatal screening should not be a replacement for ongoing surveillance throughout infancy and early childhood; and (6) education of primary caregivers and primary health care providers on early signs of hearing impairment is essential. The full text of the consensus panel's statement follows. There is a clear need in the United States for improved methods and models for the early identification of hearing impairment in infants and young children. Approximately 1 of every 1,000 children is born deaf. Many more are born with less severe degrees of hearing impairment, while others develop hearing impairment during childhood. Reduced hearing acuity during infancy and early childhood interferes with the development of speech and verbal language skills. Although less well documented, significantly reduced auditory input also adversely affects the developing auditory nervous system and can have harmful effects on social, emotional, cognitive, and academic development, as well as on a person's vocational and economic potential. Moreover, delayed identification and management of severe to profound hearing impairment may impede the child's ability to adapt to life in a hearing world or in the deaf community. The most important period for language and speech development is generally regarded as the first 3 years of life and, although there are several methods of identifying hearing impairment during the first year, the average age of identification in the United States remains close to 3 years. Lesser degrees of hearing loss may go undetected even longer. The result is that for many hearing-impaired infants and young children, much of the crucial period for language and speech learning is lost. There is general agreement that hearing impairment should be recognized as early in life as possible, so that the remediation process can take full advantage of the plasticity of the developing sensory systems and so that the child can enjoy normal social development. During the past 30 years, infant hearing screening has been attempted with a number of different test methods, including cardiac response audiometry, respiration audiometry, alteration of sucking patterns, movement or startle in response to acoustic stimuli, various behavioral paradigms, and measurement of acoustic reflexes. For the past 15 years, auditory brain stem response (ABR) audiometry has been the method of choice. More recently, attention has recently turned to the measurement of evoked otoacoustic emissions (EOAE), which shows promise as a fast, inexpensive, noninvasive test of cochlear function. Each method is effective in its own way, but technical or interpretative limitations have impeded widespread application. Moreover, these approaches vary in their sensitivity, specificity, and predictive value in identifying hearing impairment. Until now, most neonatal screening programs have focused on infants who satisfy one or more of a number of criteria for inclusion in a "high-risk register." However, the use of high-risk criteria (HRC) to limit the population being screened excludes approximately 50 percent of infants with hearing impairment. The preferred screening test method for HRC children has come to be ABR, combined with audiologic followup and/or diagnostic ABR for those infants who fail the screening protocols. Despite the relatively good predictive efficiency of ABR, its cost, time requirements, and technical difficulties have discouraged the general application of this method in screening the far larger newborn population not meeting the HRC. What are the advantages of early identification of hearing impairment and the consequences of late identification of hearing impairment? Which children (birth through 5 years) should be screened for hearing impairment and when? What are the advantages and disadvantages of current screening methods? What is the preferred model for hearing screening and followup? What are the important directions for future research? The primary justification for early identification of hearing impairment in infants relates to the impact of hearing impairment on speech and language acquisition, academic achievement, and social/emotional development. The first 3 years of life are the most important for speech and language acquisition. Consequently, if a child is hard of hearing or deaf at birth or experiences hearing loss in infancy or early childhood, it is likely that child will not receive adequate auditory, linguistic, and social stimulation requisite to speech and language learning, social and emotional development, and that family functioning will suffer. The goal of early identification and intervention is to minimize or prevent these adverse effects. The consequences of hearing impairment are many. Animal studies show that early auditory deprivation interferes with the development of neural structures necessary for hearing. Human infants with hearing loss, particularly those with sensorineural impairments, may experience similar disruptions that will have a direct impact on language acquisition. Significant hearing loss interferes with the development of phonological and speech perception abilities needed for later language learning, e.g., meaningful language at the word, phrase, and sentence levels. These impairments in communication skills can lead to poor academic performance (especially reading), and ultimately, to limitations in career opportunities. The degree and type of hearing impairment impact on a child's development. Other factors can further exacerbate the consequences of hearing impairment. For example, some children have additional sensory disabilities and/or associated neurological disorders that further interfere with perceiving and processing information. Environmental factors, such as the quality of language input provided by the parents, can either facilitate or impede communication skills. Socioeconomic-related factors, such as the lack of access to health care, other associated health problems, high-risk populations, and social stresses, also may exacerbate the consequences of deficits. Early identification and intervention can address these factors, thus minimizing their effects. Over the past two decades, advances in technology have provided ever-improving opportunities to identify hearing impairments in infants soon after birth. Consequently, the systematic evaluation of the effects of earlier identification and earlier intervention can now be conducted. Because such data are not presently available, it is difficult to evaluate fully the effectiveness of early identification and intervention on language development. There are, however, a wide range of clinical observations, a number of descriptive studies, and a few statistically controlled, nonrandomized trials that support the benefits of early identification and intervention. The benefits to be gained from early intervention may vary, depending on the severity and type of hearing impairment. Children with sensorineural hearing loss who receive early amplification, when indicated, and a comprehensive habilitation program may show improved speech and language skills, school achievement, self-esteem, and psychosocial adaptation when compared to hearing-impaired children who do not receive amplification until 2 to 3 years of age. The advantages of early intervention can only be attained when the appropriate services are available and accessible to these children and their families. Answering the questions of who should be screened and when presents us with a practical dilemma. It is clear that the earliest possible identification of hearing-impaired infants is optimal for effective intervention to improve communication skills, language development, and behavioral adjustment. Identification of all children with hearing impairment at birth is ideal. As a practical matter, the cost of universal screening has been prohibitive. Attempts have been made to limit costs by focusing neonatal testing on those at highest risk. Unfortunately, research shows that this approach misses 50 percent of children who are eventually diagnosed with severe to profound hearing impairment. In spite of current screening programs, the average diagnosis of hearing impairment remains constant at about 2-1/2 years of age. In order to meet the goal of the Joint Committee on Infant Hearing to identify and initiate treatment by 6 months of age and to more completely identify hearing-impaired infants, we must dramatically change our approach to screening. Some changes can be made in auditory screening procedures that would have a minimal effect on cost but would increase identification rate. Data have shown that infants admitted to the neonatal intensive care unit (NICU) have an increased risk of significant bilateral sensorineural hearing loss (1-3 percent); the addition of other neonatal high-risk factors does not add significantly to the identification of hearing loss. Consequently, we recommend that all infants admitted to the NICU be screened for hearing loss prior to discharge. To improve the accuracy and efficiency of the test, screening should take place as close to discharge as possible. Infants in the well-baby nursery with diagnoses of craniofacial anomalies, family history of hearing loss, and diagnosis of intrauterine infection comprise a special high-risk category. Thus, they should be screened using the same protocol and followup vigilance as the NICU population. In addition to screening all NICU babies, we strongly recommend that universal screening be implemented for all infants within the first 3 months of life. Recent data suggest that this will virtually complete our identification of newborns with hearing impairment. Even though we recommend universal screening within the first 3 months, as a practical matter this is most efficiently achieved by screening prior to discharge from the well-baby nursery. The disadvantages of hospital well-baby screening, such as missed screening because of early discharge and the possibility of higher false-positive rate, are outweighed by the accessibility of all newborns to testing at this time. The addition of screening in the well-baby nursery and as a part of well-baby care will increase cost. The benefit, however, is likely to be high. For well-baby screening to be cost effective, we recommend techniques that are rapid, reliable, highly sensitive, specific, and easily administered by trained and supervised personnel. Infants who are not screened in the hospital should be screened by 3 months of age. Identification of hearing impairment must be seen as imperative for all infants and as an important adjunct to child health care. Since 20-30 percent of children who subsequently have hearing impairment will develop hearing loss during early childhood, an ever-vigilant pluralistic approach must be taken to hearing screening and identification of young children. The first approach must include the eliciting and acknowledging of parental concern regarding hearing loss and/or speech and language acquisition. At present, 70 percent of children with acquired hearing impairments are initially identified by parents. Parental concern about hearing should be sufficient reason to initiate prompt formal hearing evaluation. Another necessary approach includes ongoing evaluation of speech and language development at routine child health supervision visits using formal assessment tools. Failure to attain appropriate language milestones, especially during the first 18 months of life, should result in prompt referral for further hearing evaluation. Several causes of acquired hearing loss during early childhood have been described. For example, bacterial meningitis has been associated with a 5-30 percent incidence of profound hearing loss. We recommend that all children recovering from bacterial meningitis be referred for diagnostic audiologic assessment, ideally prior to discharge from the hospital. Other risk factors for acquired or progressive hearing loss, for which diagnostic hearing evaluation should be considered include, but should not be limited to, significant head trauma with persistent symptoms referable to hearing or balance, viral encephalitis or labyrinthitis, excessive noise exposure, exposure to ototoxic drugs, perinatal cytomegalovirus (CMV) infection, familial hearing impairment, infants with chronic lung disease or diuretic therapy, and infants with repeated episodes of otitis media with persistent middle ear effusion. Since new cases of hearing impairment can arise in early childhood, school entry screening procedures should be extended to all private and public school students. School entry screening represents an additional universal approach for the identification of hearing impairment in America's children. Schools must make appropriate referral for audiologic followup and educational intervention. Ideally, all children who have significant hearing impairment will be detected prior to the development of speech and language so that appropriate intervention might maximize their potential for normal development. An ideal screening method would also be readily available at modest cost with complete specificity and sensitivity. Unfortunately, no such screening method is currently available. Each of the current screening methods, while offering advantages, also has disadvantages. High-risk criteria (Joint Committee on Infant Hearing, 1990), which identify approximately 9 percent of newborns, encompass half of the children who are subsequently found to have hearing impairment; approximately 1-3 percent of HRC babies have significant bilateral sensorineural hearing loss. Identification of HRC babies can be performed routinely using existing hospital-based health care mechanisms at modest cost. Although lacking in sensitivity, the HRC has been used as a first stage for other screening strategies. The use of HRC to screen for hearing impairment has many disadvantages. The principal disadvantage is that 50 percent of newborns with congenital hearing deficits are not in the HRC group and are missed by this screen. Children who are not born in larger hospitals may not be routinely identified as being at risk. Another disadvantage of this screen is that followup is not optimal in most programs currently in use, thus only a small proportion of cases are identified. Auditory brainstem responses can be used to screen for hearing impairment in newborns, since ABR's do not require a voluntary response and can be done without sedation. This screening test is highly sensitive; nearly all children born with significant congenital hearing deficits could be detected in the newborn nursery using ABR and can be referred for further evaluation. However, over-referral is a problem, since there are false-positive ABR's in babies with normal hearing. In the NICU setting, for every child with significant hearing impairment who is detected, approximately six babies are referred for followup. In the well-baby nursery, where the prevalence of hearing impairment is far lower, for every child with significant hearing impairment, more than 100 babies are referred. This high referral rate may cause undue parental anxiety. Since ABR screening and followup are expensive and require trained personnel, this method has been applied principally to newborns who are at highest risk for hearing impairment (those in the NICU or the HRC). Newer automated ABR technology and innovative analysis schemes may diminish costs. Evoked otoacoustic emissions represent a newer type of newborn screening method that offers potential additional benefits. Like the ABR, this technique could be applied to all newborns prior to hospital discharge. The measurement of EOAE can be performed in the newborn nursery with less skilled personnel in a shorter time than conventional ABR and without the need for scalp electrodes. The sensitivity of EOAE in the detection of congenital hearing impairment is very high, but newborn EOAE testing tends to have more false-positives when compared to ABR, especially during the first 48 hours of life. Nevertheless, the use of EOAE in the detection of hearing impairment in well babies could be a more cost-effective way of detecting early hearing impairments. Over-referral may be a major problem. Behavioral testing (such as visual reinforcement audiometry or conditioned orienting response), usually at 6 months of age or later, may be used to detect hearing impairment reliably in almost all infants prior to the acquisition of speech and language. This method would minimize the problems of over-referral and "labeling" that are inherent in the newborn screening methods. Identified infants could begin timely rehabilitation or intervention, and later onset hearing impairments could be detected. Several disadvantages of this strategy exist: (1) traditional behavioral audiometry in a 6-month-old infant requires skilled personnel and is time-consuming; (2) unlike newborn testing, the evaluation of older infants requires reasonable access to a testing facility; (3) testing is most difficult in developmentally delayed infants who are at highest risk; and (4) some hearing impairments would not be treated until after 1 year of life because of a lack of lead time to implement intervention. There are new versions of behavioral audiometry that may eliminate some or all of these objections, but these new techniques remain to be validated in large samples. These new behavioral techniques may provide appropriate methods for use in organized hearing screening programs beyond the neonatal period. Presently, as many as 70 percent of infants and children with hearing impairment are identified because of parental concern about their child's hearing. Efforts to educate parents about signs of hearing impairment by brochures and posters in prenatal clinics and physician's offices are simple and inexpensive. Public service announcements should be used. Professional societies should be encouraged to issue position papers on the importance and current recommended methods of identification. The effectiveness of these strategies has not been extensively evaluated. Professional education involves calling attention to (1) neonatal risk factors for hearing impairment (the HRC), (2) risk factors for acquired hearing impairment, (3) early behavioral signs of hearing impairment, and (4) the ineffectiveness of crude measures of hearing sensitivity such as hand clapping, which are useless and misleading. In order to be effective, regular professional education and continuing professional education activities at regular intervals will likely be necessary to make health care providers alert and the health system responsive to identifying children with hearing impairment. Such ongoing continuing education programs have been developed by several professional organizations. Continuing professional education has begun in Colorado and Arizona, and guidelines for child health supervision have been developed by the American Academy of Pediatrics and the American Academy of Family Practice. This strategy for professional education is inexpensive and utilizes the current health care system. Ongoing developmental surveillance by attentive and educated primary health providers would likely identify those children with acquired hearing impairment. The principal disadvantage of such a system is that children do not consistently receive medical surveillance. Finally, this method may not identify children with hearing deficits before 1 year of age. The principal goal of an early identification program is to identify hearing impairment present at birth, in order to effect appropriate intervention as early as possible. In order to detect those children born with moderate, severe, and profound hearing impairment, we recommend universal newborn screening. Because of the accessibility of babies in the newborn nursery, such screening is best accomplished prior to hospital discharge. The screening of all newborn babies presents special problems in cost feasibility. There are approximately 4 million live births each year in the United States. Given an incidence of hearing impairment of 0.1 percent per year (i.e., 1 in every 1,000 live births) then 3,996,000 babies who are screened will have normal hearing sensitivity. It is vital that these babies be identified rapidly, and at minimal cost. The panel identified two techniques -- EOAE and ABR -- as showing maximal promise as universal screening tools for the newborn. As noted earlier, each has its unique advantages and disadvantages. Weighing the evidence presented, the panel felt that EOAE shows best promise as a rapid, cost-effective means of quickly discharging all babies with normal auditory systems. In keeping with its high sensitivity, however, the EOAE lacks adequate specificity. It fails a relatively large number of babies whose hearing sensitivity is, in fact, normal. In order to prevent the majority of these "false alarms" from burdening the system for followup diagnostic evaluation, a second or confirmatory screen seems desirable. The panel felt that this goal would be best achieved by a second-stage ABR screen of all babies who fail the EOAE screen. Thus the preferred model for universal screening begins with an initial screen by EOAE. All babies who pass this screen are discharged. All babies who fail, however, are rescreened by ABR. Babies who pass the ABR screen are discharged but should be flagged for rescreen at 3-6 months. Babies who fail the ABR screen are referred for diagnostic evaluation. The purpose of the followup diagnostic evaluation is twofold: (1) to verify the existence and to determine the type and severity of hearing impairment and (2) to initiate a remediation program for the child and family. It should be emphasized that only a small percentage of the total number of babies screened experiences both stages of the total screening process. If the specificity of the EOAE screen is taken as 90 percent, then 90 percent of the babies screened are discharged after the first (EOAE) stage. Only the 10 percent who fail the EOAE stage will undergo the second, ABR, stage. The roles of the two stages, EOAE and ABR, are viewed as complementary. The first, EOAE, rapidly and inexpensively rules out significant hearing impairment (99.9 percent of all babies), but has limited specificity. The second, ABR, appears to require more time and effort, but has the potential to identify failure with better specificity. Although this two-stage screening process is recommended, the panel is aware that many clinics and hospitals have already successfully implemented universal screening programs based on ABR alone. The panel encourages such sites to continue these programs. The procedure detailed above is recommended, however, as an apparently cost-feasible approach to mass screening for those teams contemplating the initiation of a universal screening program. It must be recognized that not all hearing impairment in infancy and early childhood will be present at birth. A significant number of infants and children will develop hearing impairment during the first years of life. Such losses may be acquired as a result of medical conditions or may result from progressive hereditary etiologies. The detection of late onset or progressive losses must rely on a pluralistic approach. Screening at birth is best accomplished before the baby leaves the hospital, but during the next 2 to 3 years there is no single comparable site that can serve as the optimal location for identification. It should be noted, however, that, in some locales, hearing screening programs are in place through day-care and head-start programs. Education of parents or other primary caretakers, medical and nursing personnel, and all other professionals who have opportunity to observe the child must be relied upon to recognize factors that place the child at high risk for hearing impairment and behavioral signs of a possible change in hearing status, in order to refer for appropriate audiologic assessment. School entry, to include both public and private resources, will continue to provide an additional opportunity for universal identification of children with significant hearing impairment. Finally, it should be recognized that a critical component of any screening program is a database system. Such a database is important for tracking the progress of infants and children identified by the program and for ongoing monitoring of all aspects of the performance of the screening program. Controlled trials of screening by audiologists versus trained nonprofessionals or volunteers. Controlled trials of the influence of different settings (NICU, special test environment) on the effectiveness of screening procedures. Comparison of early intervention with later intervention for different levels of hearing loss and types of intervention. Studies to allow comparison of various screening techniques; e.g., randomizing to different decibel thresholds (30 versus 40) or to allow comparison of conditioned orienting response (COR) characteristics. Compare various screening procedures (e.g., transient evoked otoacoustic emissions with distortion product otoacoustic emissions) for time and cost. Test the feasibility of screening methods for identifying hearing impairment in infant populations at 1 month, 3 months, and 6 months in remote satellite clinics servicing ethnic minority populations who may be particularly at risk for hearing impairment (examples are Native Americans, Hispanic Americans, and African Americans). Develop innovative behavioral audiometric tests that are applicable for screening programs. Determine whether a two-tier screening system (screen, confirm, evaluate) works better than having a failure lead to the evaluation system. Study the cost-effectiveness of universal screening for infant hearing impairment. Develop and evaluate programs for intensive parent education pertaining to developmental milestones related to normal language acquisition and indicators for identification of hearing impairment in infants and young children. Develop and evaluate programs for intensive professional education regarding the need for early identification of hearing impairment and early intervention. The lack of early identification of hearing-impaired infants continues to be a significant public health problem in the United States. The result of this delay in identification leads to delay in appropriate clinical intervention. Because present screening is not universal but based on high-risk criteria, we currently identify between 30 and 50 percent of those children born with significant hearing impairment. Moreover, the average age of identification remains close to 3 years. Recent technological developments have produced screening methods that are rapid, reliable, sensitive, and easily administered. This consensus panel concludes that these advances offer an opportunity, for the first time, to initiate universal screening for hearing impairment in early infancy. The panel endorses the recommendations of the Joint Committee on Infant Hearing that all hearing-impaired infants should be identified and treatment initiated by 6 months of age. In order to achieve this objective, the panel recommends universal screening for hearing impairment prior to 3 months of age. Because of the unique accessibility of almost all infants in the newborn nursery, the consensus panel recommends screening of all newborns, both high and low risk, for hearing impairment prior to hospital discharge. Clearly, universal screening will increase the number of infants identified with hearing impairment. This will necessitate adequate diagnostic followup and treatment facilities. Comprehensive intervention and management programs must be an integral part of a universal screening program. Because 20-30 percent of hearing-impaired infants will acquire their hearing loss during early childhood, universal neonatal screening is not a replacement for ongoing surveillance throughout infancy and early childhood. The panel encourages continued awareness of the necessity for early identification of hearing impairment. Education of primary caregivers and primary health care providers on early signs of hearing impairment remains an important goal. School entry screening will provide another opportunity for universal identification of children with significant hearing loss. Agnes M. Aamodt, Ph.D., R.N. Richard A. Chole, M.D., Ph.D.
Ronald S. Fischler, M.D., F.A.A.P. North Scottsdale Pediatric Associates, P.C. "Social/Emotional and Academic Consequences of Hearing Loss"
Patrick E. Brookhouser, M.D., F.A.C.S. Marion P. Downs, M.A., D.H.S. "Benefits of Screening at Birth: Economic, Educational, and Functional Factors"
"The Auditory Brainstem Response in Infants: Basic Aspects"
"The Public Health Perspective on Screening -- U.K. Experience and Recommendations"
"Hearing Screening of Infants With Auditory Brainstem Response: Protocols, Personnel, and Price"
"Causal Factors and Concomitant Impairment"
"Site of Lesion and Age of Onset"
"Utility of Distortion-Product Otacoustic Emissions in Identifying Hearing Impairment in Infants and Young Children"
"Developmental Screening in a Busy Clinic: A Luxury or a Necessity?" "Characteristics of Transient Evoked Otacoustic Emissions in Pediatric Populations"
"Effects of Hearing Impairment on the Development of Speech"
Terence W. Picton, M.D., Ph.D.
"Recording the Auditory Brainstem Response in Infants"
Robert J. Ruben, M.D., F.A.C.S., F.A.A.P. "Early Identification of Hearing Impairment in Infants and Young Children"
"Evaluation of Hearing in the Neonate Using the Auditory Brainstem Response"
"Models for Early Identification and Followup: An Overview"
"Auditory Brainstem Response Testing in the Neonatal Intensive Care Unit"
"Practicality, Validity, and Cost-Efficiency of Universal Newborn Hearing Screening Using Evoked Otacoustic Emissions"
James B. Snow, Jr., M.D. Since the NIH Consensus Statement on Early Identification of Hearing Impairment in Infants and Young Children was issued, additional information has become available that supplements the original statement. 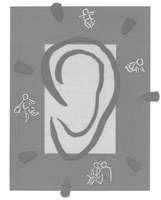 The National Institute on Deafness and Other Communication Disorders (NIDCD) convened a Workshop on Universal Newborn Hearing Screening on September 4-5, 1997 in Chevy Chase, Maryland. The purpose of the workshop was to develop acceptable protocols for statewide universal newborn hearing screening programs. The charge to the Working Group was to examine current hearing screening technologies that can be used by States to identify infants who will need special intervention for hearing impairment.